Hello everyone how have you all been? This weekend while I was shopping for my sisters birthday present I noticed that Clinique has a gift promotion on when you brought two or more products. Now if you read my post about how I cured my acne HERE you will know that I religiously use my Clinique products day and night. So when I saw I was coming to the end of my clarifying lotion I knew I had to buy more very shortly. Now I always find it very hard not to buy two products when these promotions are on, what can I say if I am given the opportunity to buy more I do let’s just say I need no encouragement. So while I knew that I was going to get another Anti-Blemish Solutions Clarifying Lotion but I was really unsure about what to get as my second product. 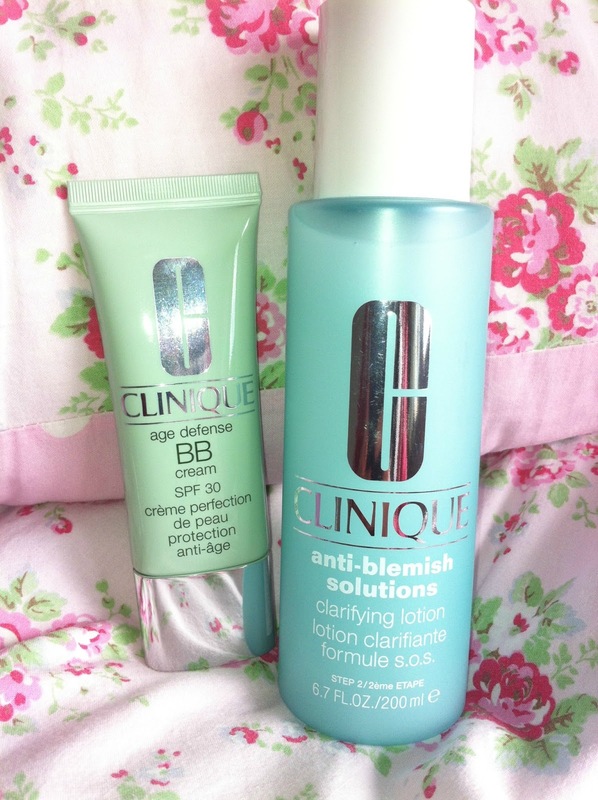 I am going on holiday very shortly and therefore I do not want to be wearing foundation while I am there and have been looking into various BB creams, when I saw that Clinique offered one I decided that it would be my second product. I have not yet tried it as but if you are interested in a review of the product then leave a comment below. According to the packet the BB Cream can be worn alone or as a primer. I am very interested in seeing what it is like as a primer as this is not a use I was intending to use it for, so if it is a good primer it will be an added bonus. 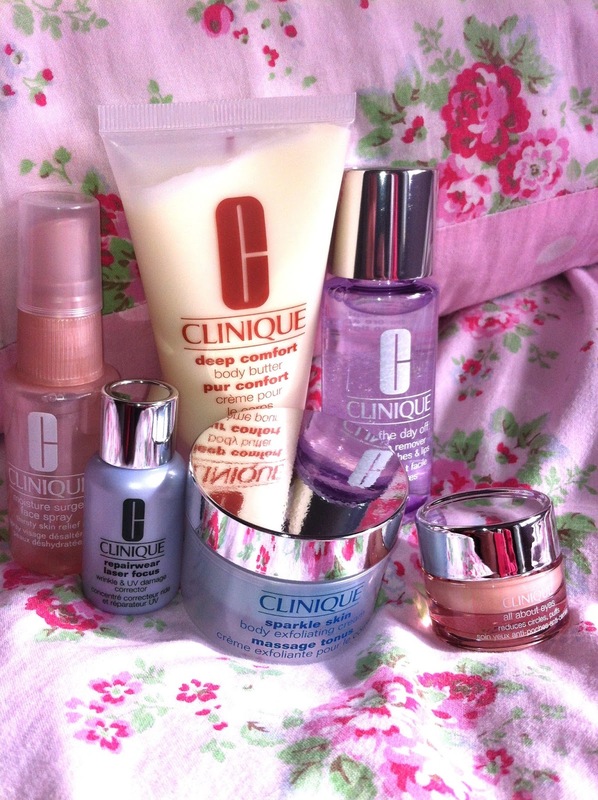 Clinique say that it has a ‘long-wearing, oil-control formula’ which is ‘appropriate for all skin types’. Now onto the free gift, I always get excited when a free gift is offered even though I know that the gift is always the same kind of thing with maybe a few changes. Take the day off makeup remover for lids, lashes and lips – This is a product that you get in most of the Clinique free gifts, therefore it is something that I have used before and I do genuinely like apart from the fact that it is slightly greasy once applied. It really does take off even the toughest mascara, but I can honestly say that I have not tried using it to take makeup off my lips. Repairwear Laser Focus Wrinkle & UV Damage Corrector – This is a serum which is meant to be ‘A second chance for every skin with wrinkles’ this product is meant to reduce the appearance of wrinkles. Moisture Surge Face Spray – I am very excited to try this product on holiday, it is an oil-free facial spray and is meant to restore the moisture balance within the skin. 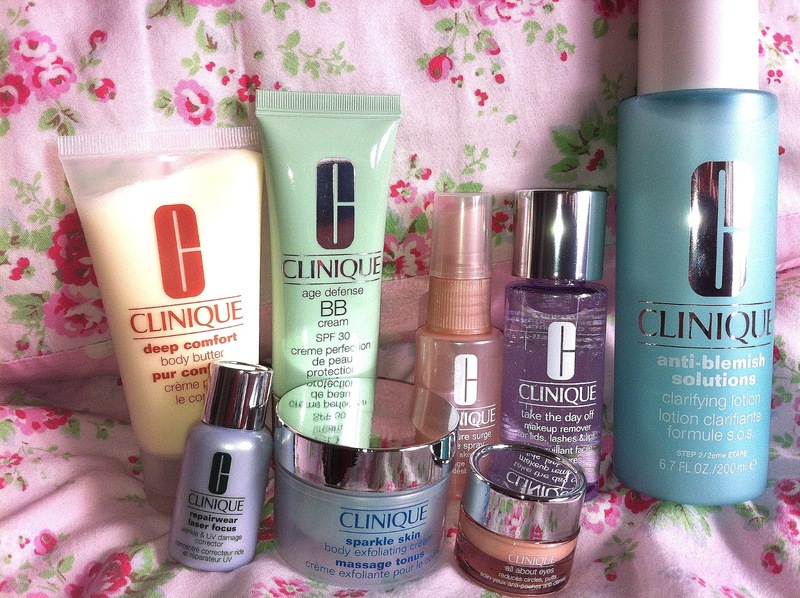 All about eyes – Clinique markets this product to reduce the appearance of ‘puffs, circles, fine lines and shadows’ I have very dark circles under my eyes and I have to say even though this has come within many of the free gifts it is a product that I have never used. I am therefore very excited to try it. Deep Comfort Body Butter – I am excited to try this body butter as I get particually dry elbows, which is a problem that this product is meant to target. I am slightly disappointed with the smell though as it does not have any significant smell. im your new follower from greece! You will love that free gift! I use the Repairwear, All about Eyes, and their 3 step skin care regimen religiously. 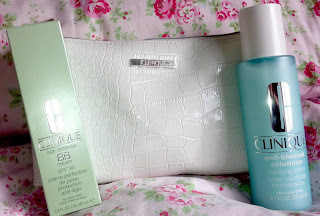 I am a huge fan of their "CC" Cream, which is a slightly newer product than the BB cream. I mostly buy products when special offers like free gifts are on. You get more for your money and get to try new things too. 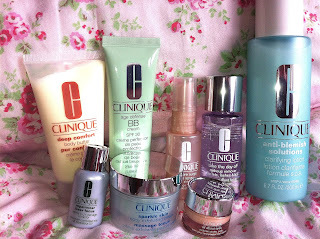 I'd love to try some Clinique skin care! I've not tried much of their products, ill need to get round to buying some! I agree about the eye makeup remover , it does leave a little grease behind. you tried the eye remover balm they used to do?